Its official-my FIRST EVER “art hanging” is now underway. 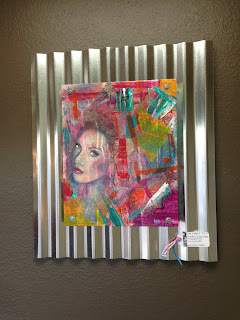 I now have 35 pieces of artwork hanging in Pinky’s Hair Salon-located at 53rd and H Street in Sacramento, CA. We all have that inner voice that never stops. It worries, criticizes, complains, and at times even screams. If left unchecked, it can take over and drown out our very essence, that part of us that is who we really are when the inner voice is silenced. Custom framing is decidedly contemporary, with an industrial edge, to highlight the strength and openness of the true self underneath the noise. The soundtrack of my life is an eclectic one and helps me drown out the inner voice. 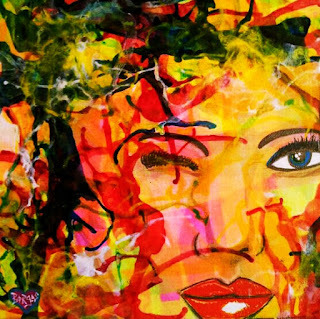 In this series, I pay homage to some of my favorite women in song who are all pieces of me. My hubby and I had a lot of fun designing the framing used in this hanging. So much so that we are going to continue exploring in this area and start making it available to others. The frames work very well with your pieces and are so original. I like the way you have thought through the philosophy of your art. Interesting about your difficulties with price. I was looking at the Daily Paintworks gallery and decided that most of them are priced too low. But maybe this is because they are on the web. Or maybe I am being unrealistic. Who knows? Congratulations and good luck on your show. Many red dots!! Congrats! I had not realized when I found your blog that you were also in Sacto... I will have to go visit Pinky's and see your stuff! It looks very professional, congratulations! This is a wonderful milestone for you, Felicia! Looks like you got your pricing successfully resolved! I have to comment again on the artful framing of your work. It is definitely unique and so perfectly showcases your art. I am thrilled for you! Oh wow! That looks so fabulous, both your work AND the framing! Congratulations on these exciting times!